Over six months since my last blog! 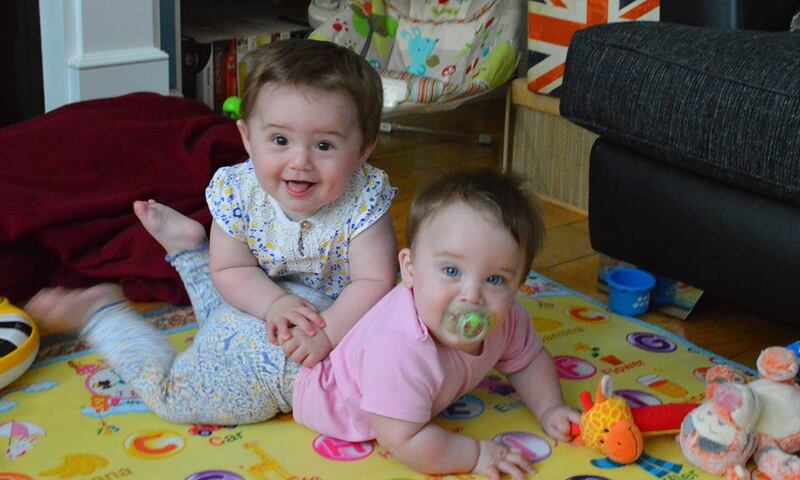 The girls are 9 months old next week and looking after them is intense (they're crawling, standing, into everything and I can't take my eyes off them for a second!) but they're also very entertaining and although it's taken me a long time, I'm finally feeling happy, able to cope and I think we're all managing really well. 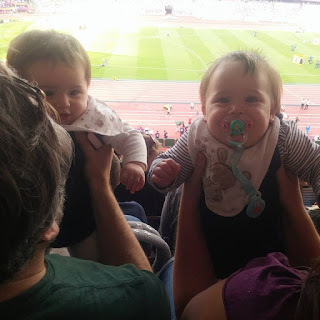 We've been making the most of the summer with lots of outings - the Village Green festival, picnics, a Ferrari parade, Leeds Castle, visiting family and yesterday, we went to the Olympic Stadium to watch the IAAF World Championships - they absolutely loved it and we had a wonderful time! Unless you follow me on twitter, you'd be forgiven for assuming that I had let my running fall by the wayside now I'm so busy with the girls, but I have been able to keep up a bit of training. I find it's been absolutely essential for my mental health and maintaining some sense of self, as well as genuinely enjoying getting out on the trails. 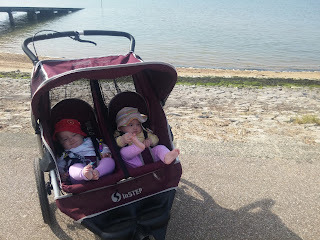 I've not done as much as I'd like - time is so limited - but I've been getting out on average two or three times a week, usually between 4 to 6 miles, often in the woods with Chewie, or occasionally with the twins in our awesome running buggy, along the Southend seafront, where there's a wide flat promenade. I'd hoped to be able to get out with them more, but with the weather hasn't helped, and timing is difficult as I need to have both girls ready to nap at the same time for us to go! I'm hoping this will be become less of an issue as they get older, because I have absolutely loved the runs we've had so far. Anyway...on this very limited mileage, I've managed to take part in two local races, with Francis looking after the girls for a few hours. 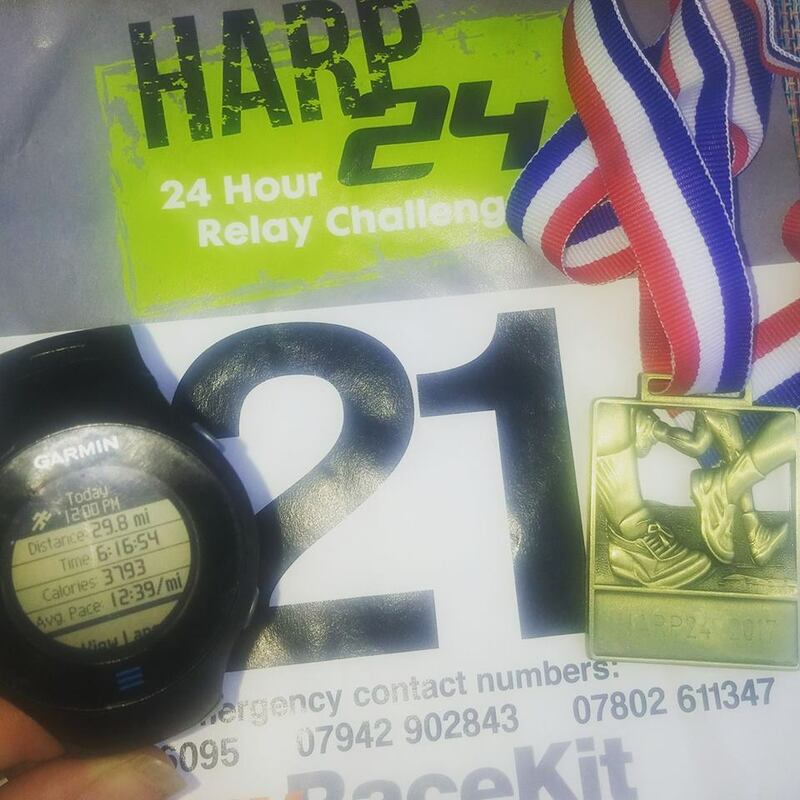 In March, I ran (and walked) a half marathon at the Hockley Woods Trail Challenge - a very hilly and quite muddy race - in 2:50. 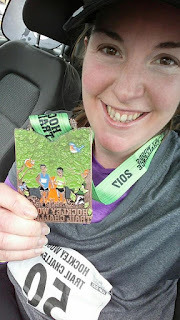 I felt incredibly slow, and I found it such hard work, but I really enjoyed myself and loved being out in the woods, and am so proud to have got that distance done just four months after the girls were born. It was lovely to catch up with some friends there after so long out of the running scene! In June, I went to the HARP 24 hour race, and gave myself six hours to run as many of the 4.2 laps as I could, hoping for at least a marathon distance finish. I was feeling relatively confident but once I started I realised how unfit I still was, and how very far away I was from my levels of pre-pregnancy endurance. By about 5 miles I was run/walking, and by about 8 miles my legs felt shot. 8 MILES!! I just kept thinking about how far I used to run comfortably... There was another runner who was wearing his GUCR t-shirt from this year's race. Once I would have felt a camaraderie with him but I felt a bit of a fraud even being at the race, as he ran past me when I was going so slowly. Looking at some of the photos from the day (other than the start line picture) I see how hard I'm finding it - the grimace on my face tells it all. But I was determined that I would not give up, and I would cover a good distance. I walked a lot, generally alone, and felt so absolutely shattered I was seriously considering going and lying down in a field for a nap. I was very miserable for much of the day, although it was an absolutely lovely course which looked beautiful on such a sunny day, and I wish I could have enjoyed it more. Through sheer bloody mindedness, I dragged myself through seven laps, completing 30 miles. I spent the last lap with Ian, a fellow ultra runner, who I've not seen for years, but chatting with him for those 45 minutes was brilliant. I ran more than I'd done for the whole day! Had I not seen Ian, I may well have left the race thinking I should just throw in the towel and give up on my attempt to reach my 100th marathon until the girls are older, but actually I came away reminded why I love running, and confident that I can keep going! So, now onto my next race - the self-navigation Darnley Challenge in 5 days time, which Francis bought me entry to as part of my birthday present, where I'm hoping to run two laps, completing the marathon distance. Francis is taking the day off work to look after the girls, and I really want to make the most of it! However, I'm still feeling incredibly unfit and overweight. I struggle to fit in any long runs, and haven't run further than 6 miles in 6 weeks since the 30 miler. It's not making me feel confident in the slightest, but the race has a limit of 8 hours (it took me 5hrs 30mins to run/walk 26.2miles at HARP) and so even if I walk more I should be ok, but there's an option to drop to a half marathon distance if I need to. That wont help my "Quest for the Vest"...but hopefully I can just enjoy my day out and come away feeling positive again!